Relate: Just a short time ago I saw something I didn’t think I would ever see inside a city of over fourteen million people. I was just walking down my street when I saw a truck parked just outside a large, building whose ground floor looks to be a warehouse. On the back of this truck was a cow. There were two men pulling on a rope halter trying to get that cow down from the truck into that empty dark room. On the truck with that cow, another man was pushing on it’s rump with everything he had. It sure looked to me that those three men were fighting a losing battle. That cow was not being very agreeable. As I walked by and tried my hardest not to laugh, inside I was thinking, “Don’t give in, cow. Nothing good will happen in that room.” I was half tempted to stop and take a picture, but then I would have to have done the neighborly thing and help them with their struggle. 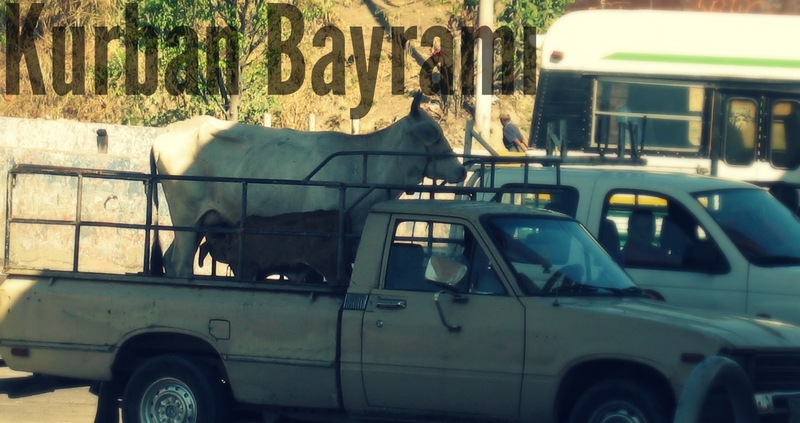 Beyond the fact that I am allergic to cows, (not their meat) I don’t really know what I think about helping a Muslim family out with celebrating Kurban Bayramı. React: Jews, Christians, and Muslims all agree to the basic facts of this event in history. Abraham was willing to offer his son as a sacrifice. God provided a lamb instead. Where the disagreement comes into play is on the importance of the sacrifice. For the Jew, the sacrifice of an animal covers our sin and makes us right with God. For the Muslim, Abraham’s obedience proved that he was righteous and at peace with God. For the Christian, it is the substitution that makes us right with God. God, no other sacrifice is enough. Nothing I can give up or kill will ever make atonement for what I have done. All it can do is remind me how far I have wandered from Your ways. No amount of submission, good deeds or righteous works will ever be enough. Even my best efforts will far so far short of Your standard of perfection. You alone are enough. Your sacrifice on my behalf, although I could never deserve it, has brought me peace with God. Thank You, Jesus, for the cross. So as the world around me celebrates the feast of sacrifice, so I too celebrate the sacrifice that was made on my behalf. You will be in my prayers as you continue on your Discipleship journey. Cling tight to the hand of Jesus and so very close to your discipler. May God bless you with knowledge, which leads to wisdom, a kind and loving heart for all people, goodness that the people will be drawn to you, discernment to be able to tell thd fools from the pure in heart and a voice that you will be able to proclaim Good News. Amen. And thanks be to God for purgatory. Mercy we show to others will be shown to us.